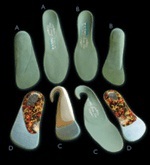 Orthotics are shoe inserts that are used to correct an irregular walking pattern. They perform functions that make standing, walking and running more comfortable and efficient, by slightly altering the angles at which the foot strikes the walking or running surface. Orthotics differ from commercially made devices such as cushioned heel cups or insoles for shoes. These are sold over-the-counter in drug stores. 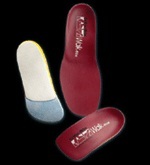 Custom-made orthotics, however, are devices made specifically to meet individual needs. Doctors of Podiatric Medicine and orthopedic surgeons often prescribe orthotics as a conservative treatment for many foot problems, or as a method of control after certain types of foot surgery. Their use is a highly successful, practical approach to treatment. Orthotics come in various forms and are constructed of various materials. All are used for improving foot function and minimizing stress forces that could ultimately cause foot pain or foot deformity. Orthotics are made by taking an impression of the foot, called a cast. The impressions in the cast duplicate any misalignments in the foot. Then, the orthotic laboratory corrects the misalignments using compensation and stabilization techniques. The finished orthotic is then put into the patient's shoe and assists in keeping the foot properly aligned. In some cases, the orthotic may have padding to cushion the foot against the weight of the body. The functional orthotic device, designed to control foot function, may be made of a firm material such as plastic or carbon fiber, and is used primarily in walking or dress shoes. It is generally fabricated from a Plaster of Paris mold of the individual’s feet. The finished product extends along the sole from the heel to the ball of the foot or to the toes of the foot. It is mostly worn in closed shoes with a heel height of less than two inches. Because of the materials involved, very little alteration in shoe size is required. Functional orthoses are designed to control motion in two major foot joints, which are directly below the ankle joint. These devices last a long time, do not change shape, and are hard to break. Aches and pains in the legs, lower back or thighs may be due to abnormal function of the foot, or to a slight difference in leg length. In these cases, orthotics may improve or eliminate these symptoms. 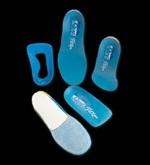 Accomodative orthotics help to absorb shock, increase balance, and take pressure off uncomfortable or sore spots. They are usually made of soft, compressible materials, and may be molded by the action of the foot in walking, or fashioned over a plaster impression of the foot. Also worn against the sole of the foot, it usually extends from the heel past the ball of the foot to include the toes. 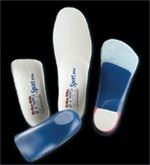 The advantage of any soft orthotic device is that it is easily adjusted to changing weight-bearing forces. The disadvantage is that it must be periodically replaced due to compression over time. It works particularly well for arthritic and grossly deformed feet where there is a loss of protective fatty tissue on the side of the foot. It is also widely used in the care of the diabetic foot. Because it is compressible, the soft orthotic is usually bulkier and may require more room in shoes, or may even require prescription footwear. Usually, the orthotics need to be replaced when the child’s foot has grown two shoe sizes. 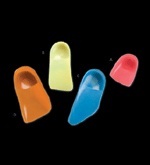 Different types of orthotics may also be needed as the child’s foot develops and changes shape. The length of time a child needs orthotics varies, depending on how serious the deformity is and how soon the corrective process begins. Perfect feet are rare, and therefore just about anyone can benefit from orthotics. Orthotics are especially helpful in treating over-pronation, or flat feet. They can also prevent and help improve many of the foot problems that cause discomfort in otherwise healthy people. Think of it in terms of wearing eyeglasses. Both eyeglasses and orthotics adjust bodily imperfections that prevent people from functioning at their full physical potential. In both cases, a physician will do a complete examination and prescribe the proper amount of correction. Feet should not hurt. Pain is the body's way of warning you that something is not right. If you ignore pain, whatever is causing it could get worse.